Today I have a few great pattern mixes for you. I started off my outfit with our Ivory V Neck Long Sleeve Top and my own athleisure inspired side-stripe pants. The top is a very versatile long sleeve V neck jersey top made out of rayon modal which is super soft and buttery fabric that feels great against your skin. I showed you the same top last week in a camel color and you can see that top here. As usual I have tucked in the front of the top but you can see in the side-view photo that it is quite long. With this top and pants being my base outfit, I first added our fun Black Ivory Stripe Knit Vest with Fringe. This vest is a great statement piece that can make any outfit pop. It can be worn two ways. One way the back looks longer and if you twist it the other way the back can be shorter. It is finished in a way that the stripes become self fringe at the ends. I showed you the tan/ivory version of this vest a couple of weeks ago and you can see that piece here. 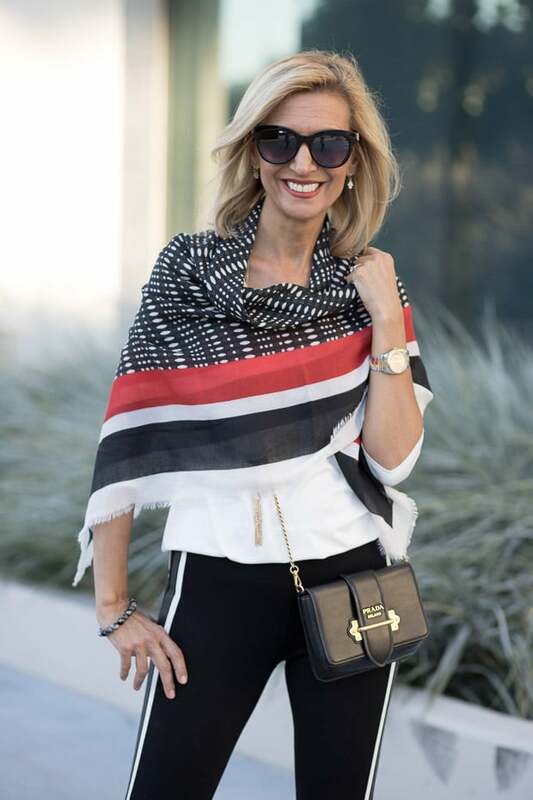 To take the outfit up a notch, I added a great scarf we have just added to our shop, our new Black Ivory Red Geometric Square Scarf Shawl. I love mixing the geometric pattern of this scarf with the stripe vest. The little bit of red mixed in the scarf, gave me the opportunity to wear my favorite red flat mules with the outfit. You can also do a red bag instead if you would like to add even more color. For a second outerwear piece, I added our brand new Gray Black Ivory Reversible Plaid Poncho. This is a sister to our Tan Brown Rust Reversible Plaid Poncho that I styled for you last week and you can see that piece here. I love that it is reversible and you get two ponchos in one, where one side is a big plaid and the other side is a small plaid. The fabric is very cozy and it is finished / hemmed around the edges with a great looking novelty stitch in black. For accessories, I added our Gold Tone Chain Necklace with Black Clover and Fringe and Black Gray Gold Bead Bracelet. All 6 pieces I am showing you today are part of our Weekend Flash Sale where you can get 15% off with code FS929 plus Free US Shipping. All international shipments are a flat rate of $25.00. How do you like these looks? I am interested by the pants, do you sale them? No unfortunately we do not sell any bottoms at this time. I bought these pants at Zara last year. I think they may have more similar to this so check out their web site. Those red slides are just fantastic. So cute with the pops of red on the scarf and the classy b/w! I love these looks! The scarf is beautiufl, I love the red and black pattern and the reversible plaid Poncho is my fav. Love the touch of red with your slides too, just perfect styling!